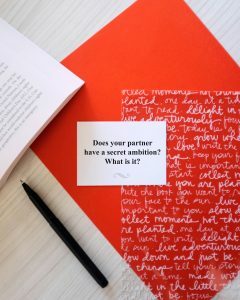 Does your partner have a secret ambition(s)?? Do you?? When’s the last time you two sat down together and talked about your ambitions? In the course of a relationship, ambition fluctuates. It’s easy to get stuck, on autopilot. It’s a warning sign ⚠ that it’s time to access those ambitions! They’re there, you just have to let yourself and your partner bring them forward, become curious about them. Let your inner weirdo, freak flag fly! (hint: don’t create, judge or mold them for each other, allow it to come from within) Clap for each other’s ambitions, be each other’s cheerleaders, get on board- push each other’s boundaries, and ambitions forward to expand your life & theirs. There’s no limit to ambition! Perhaps you’ll take turns, shifting from one partner to the other. But, never stop being ambitious! What are your ambitions? What are your partners? ?